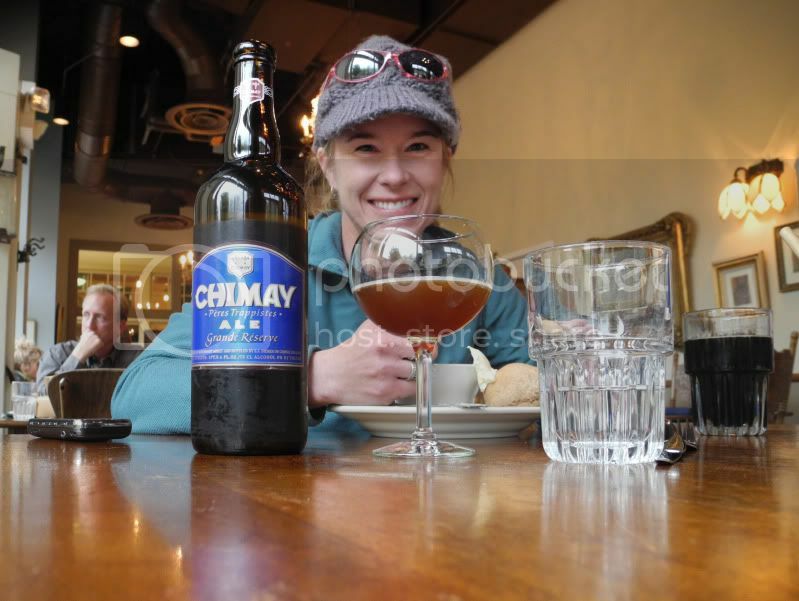 This is the final post of an ongoing series re-telling Brittany’s fourteener-skiing story. These reports were delivered every Thursday, as part of a Throwback Thursday theme. 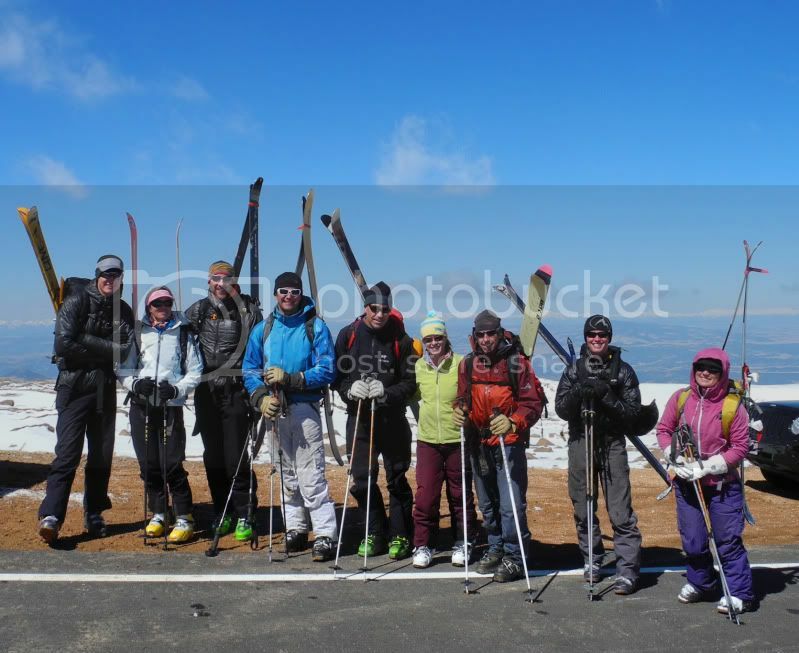 Visit Brittany’s Fourteener-Skiing Journey to view all the reports! 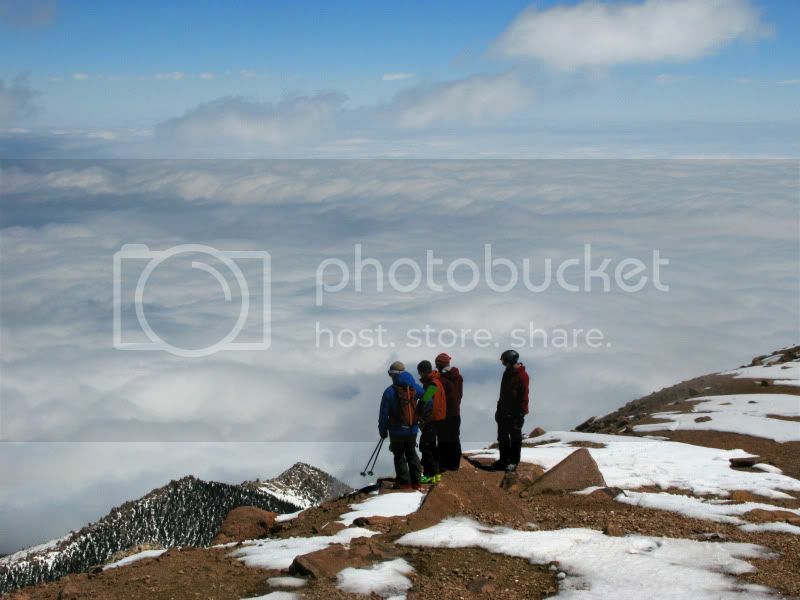 When I was about 2/3 of my way through my fourteener-skiing project, I started to think about which peak I would save for last. A few finishers had ended on Capitol, often thought of as the hardest one. 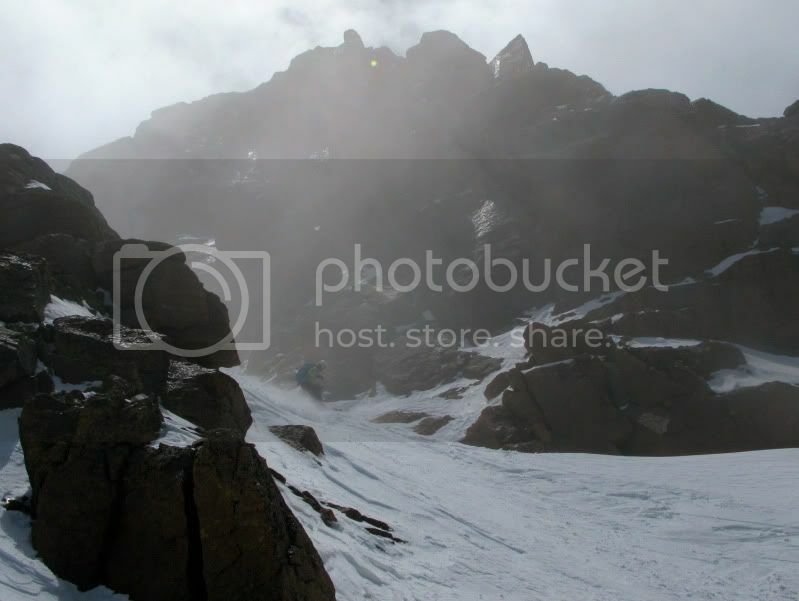 But, after observing the pressure that these finishers had to deal with in needing a difficult fourteener to come into condition to finish the final peak of their project, I decided I wanted to finish on something “easy”. 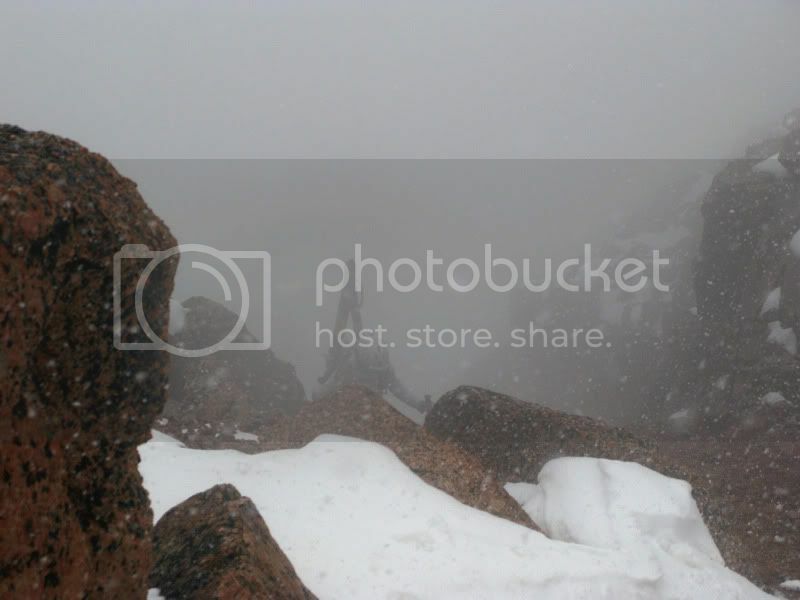 So, I looked at the list of peaks I had remaining, and Pikes Peak seemed to fit the bill. My thought was that I could have a party, since it is possible to drive to the summit. I would invite friends who have helped me along the way, and have a big celebration! 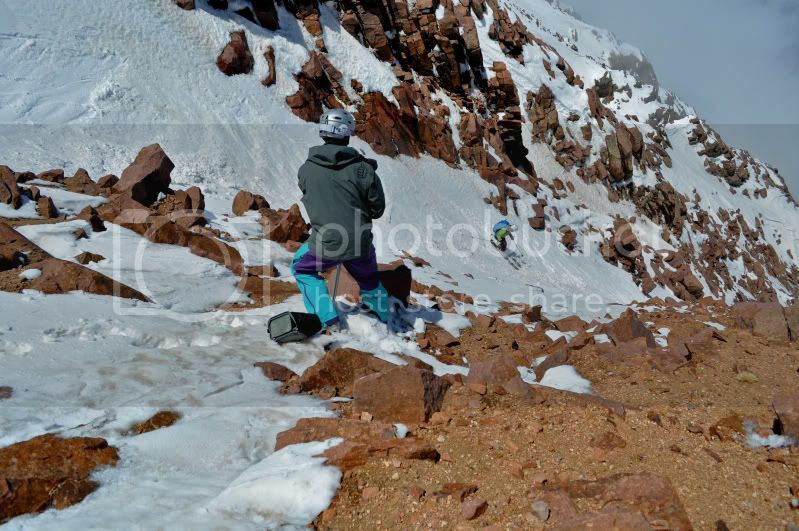 Below is a slightly modified version of my report for skiing Pikes Peak, which would become my 54th fourteener skied, completing my fourteener-skiing project! I’ve thought about this day for a long time. 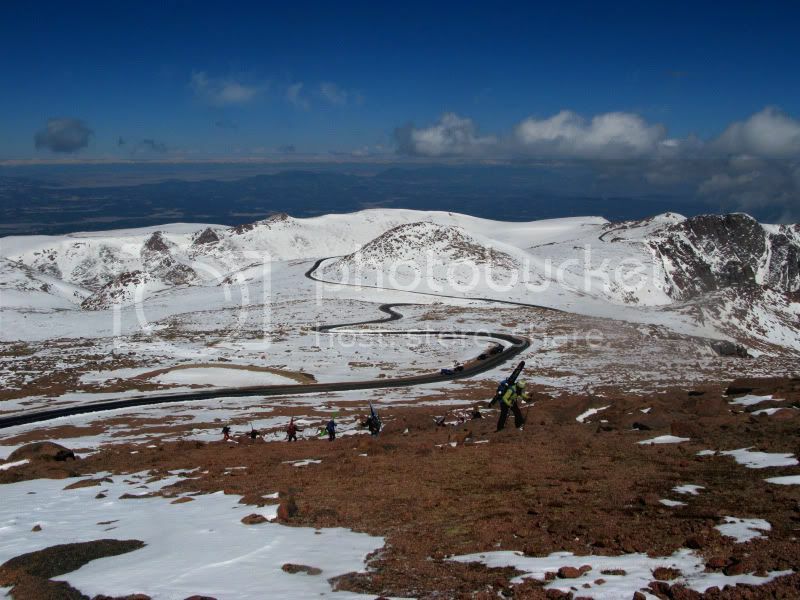 My final fourteener descent- Pikes Peak. How did it come to be here? 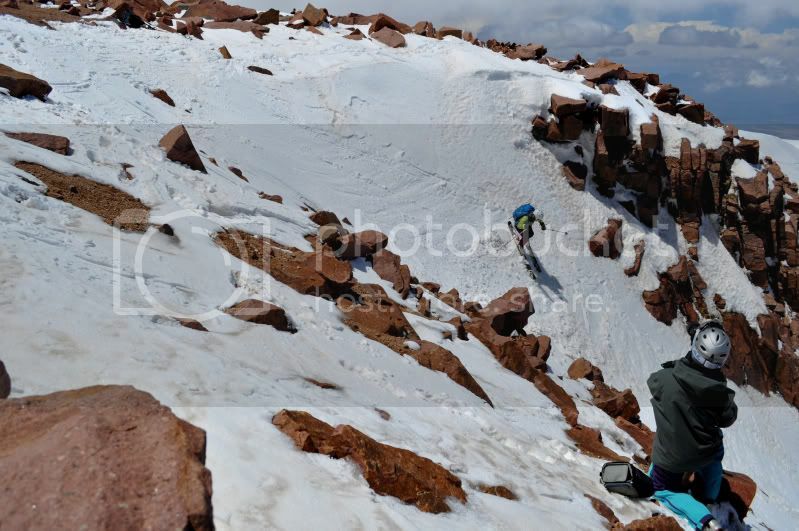 I was given the advice by other fourteener skier finishers to make sure to save an easier peak for last. 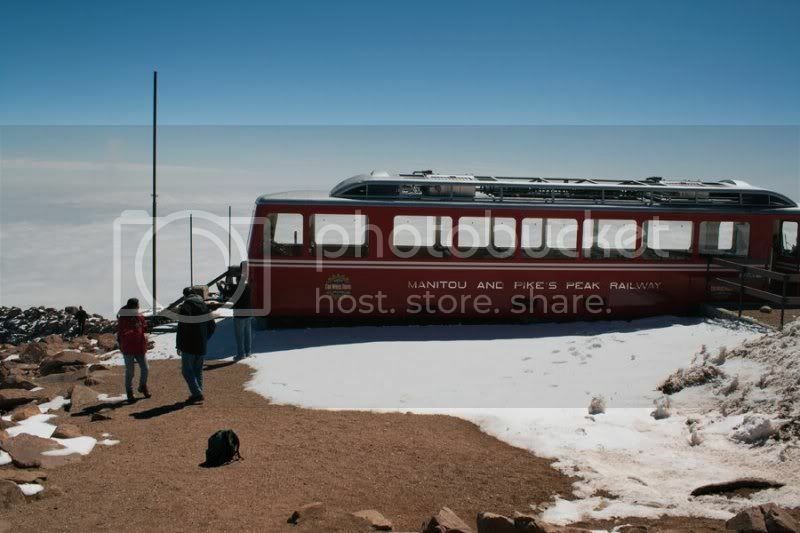 By the time I was given this advice, I basically had one “easy” peak left- Pikes Peak. But, parties can be hard to organize. 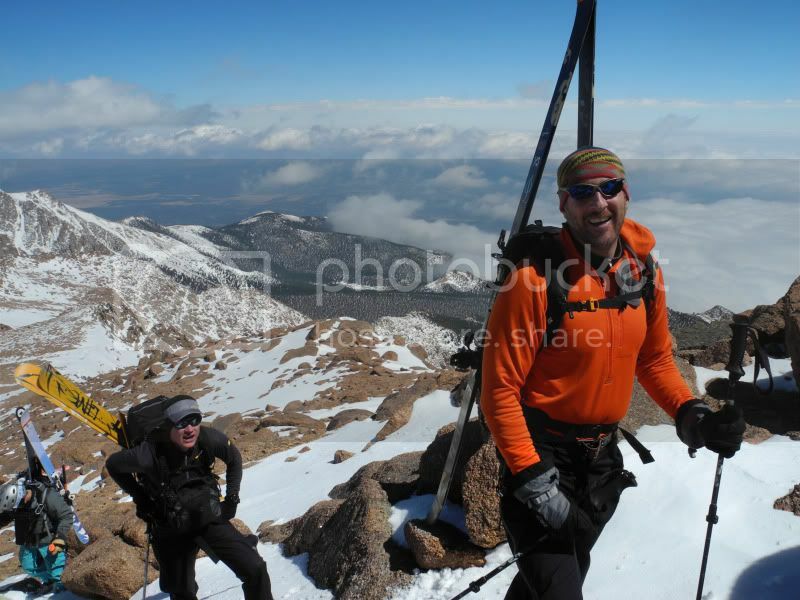 So, I opted to wait over a week in hopes that more people could join me on my last fourteener. Because the chances of the road opening to the summit was slim, I kept my fourteener party small–although I genuinely wanted a full on rager 😉 Frank and I picked up our friend Jamie in Golden, and headed to the bottom of the Pikes Peak Roadway where we rendezvoused with the 8 other members of our group. 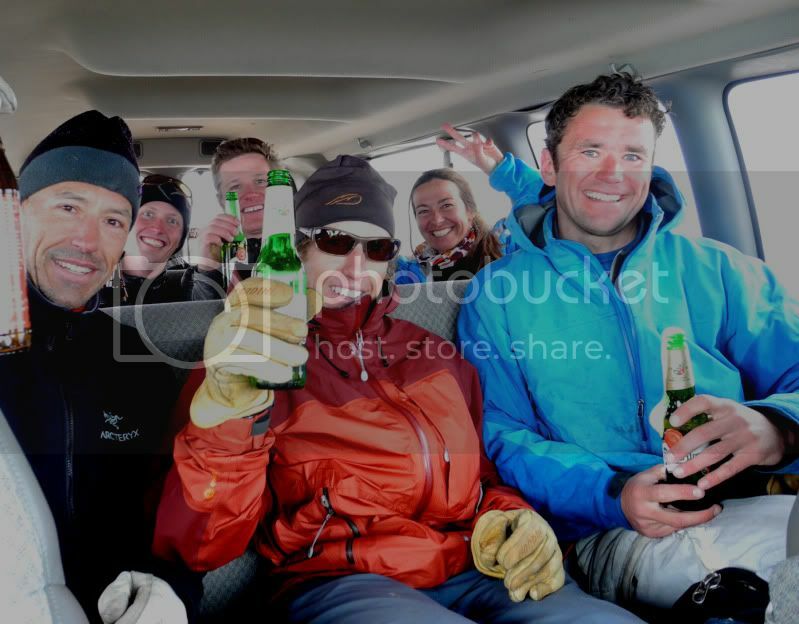 We consolidated our gear and ourselves into 2 vehicles and began heading up the road. At the gate, we were told that the road was open 16 of the 19 miles. But, the road crews were out. We parked on the side of the road near mile 16 and began unloading our heaps of gear. Just as we were about ready to make the trek to the summit, the road crew drove by and announced that they were opening the road another 1.5 miles. So, all the gear we unpacked was re-packed. And we squeezed ourselves into our two vehicles once again. 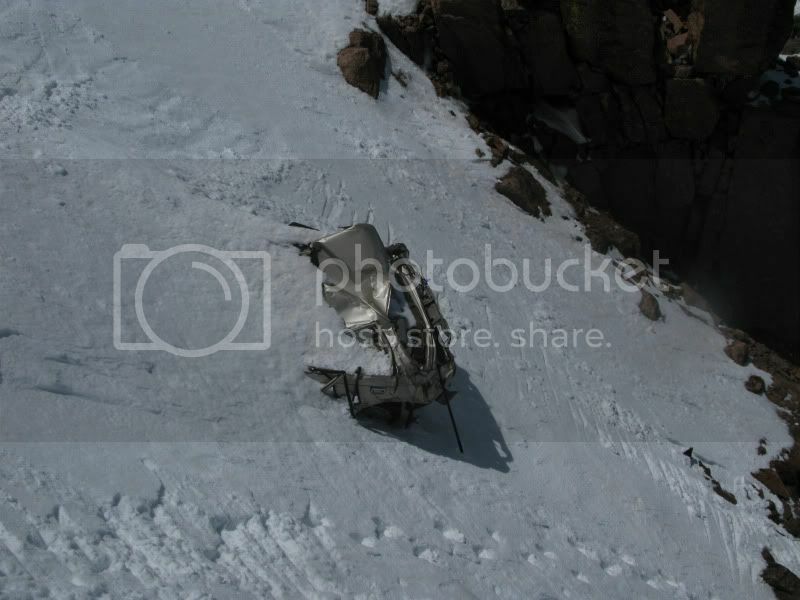 At mile 17.5 we unloaded once again, and laughed when we saw just how close the summit actually was. Sure, it was a mile and half on the road, but it was practically a hop, skip, and a jump over scree. 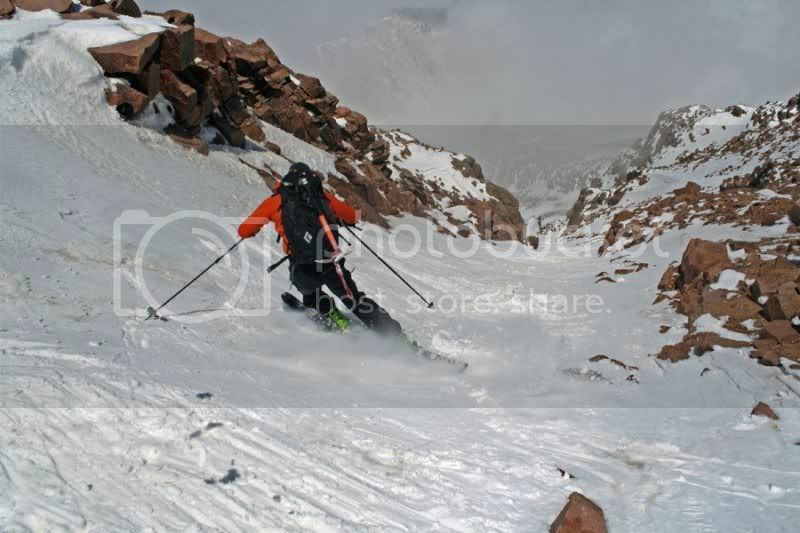 There is no doubt that fourteener skiing has evolved at an alarming rate in the last few years. 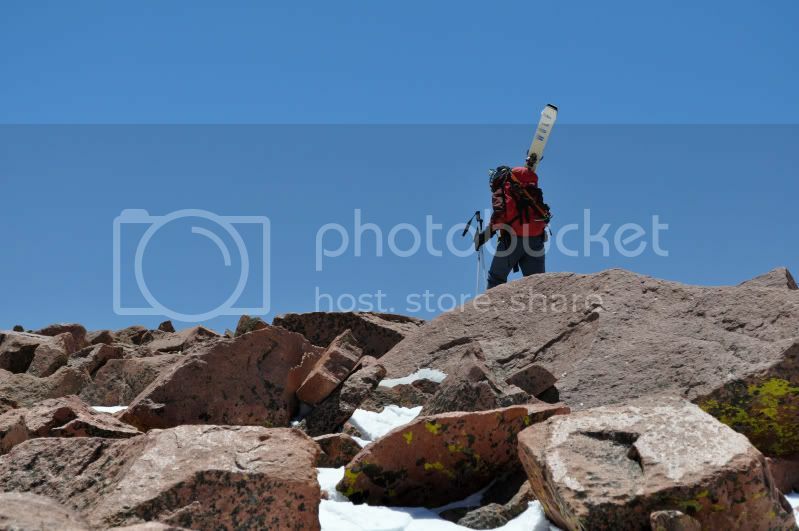 Still, there are fourteener-skiers out there, discovering new lines (like Matt’s line on Yale), and working their way to checking those last fourteeners off the list. I can’t wait to help some of these people across the finish line! 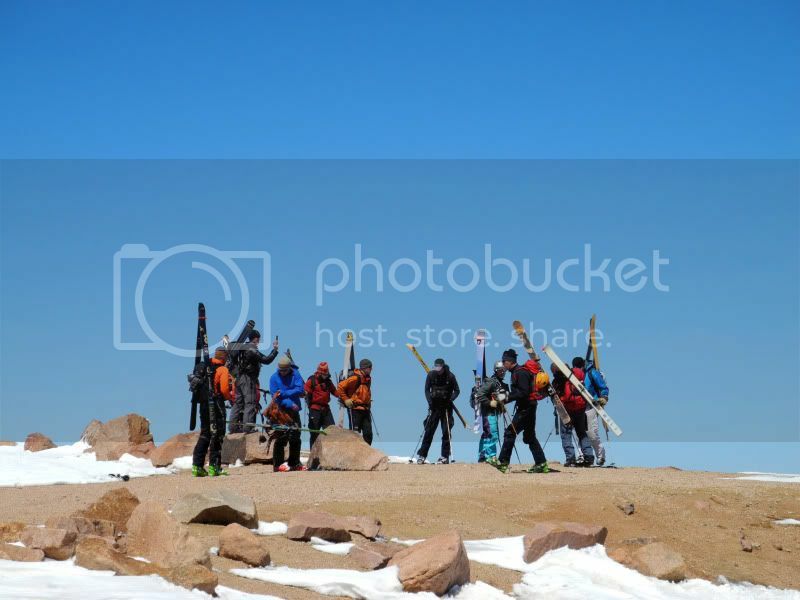 Note: After writing this, others have finished skiing the fourteeners as well, including Carl Dowdy, Matt Kamper, Marc Barella (2nd snowboarder), Austin Porzak, and Michael Steinman. 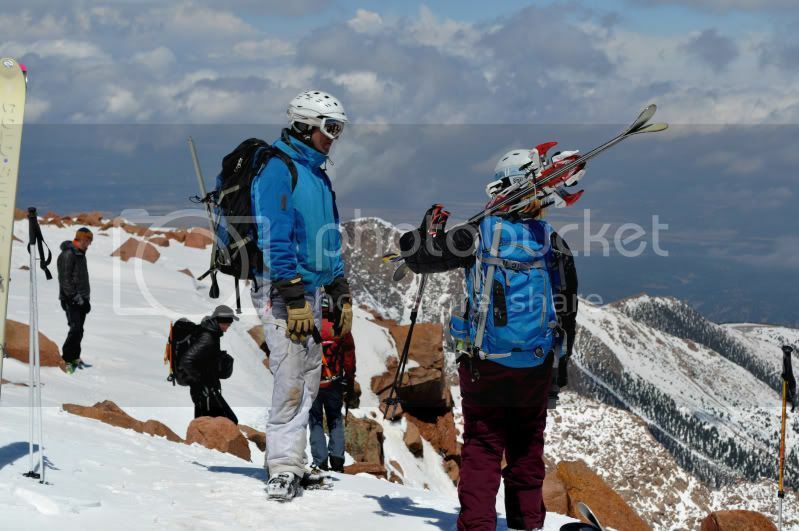 Thank you to Jordan White for getting me up the toughest of toughest fourteeners. I don’t know who I would have gotten Capitol done without him. When I first met Jordan, he couldn’t even drink a beer with us at the bar. But, now he’s out there tackling and guiding big mountains, and rescuing people along the way. It’s been so wonderful to see you grow as a ski mountaineer and as a person. And my biggest thanks goes to my best partner and now husband, Frank Konsella. I met Frank shortly after skiing my first fourteener, largely because I was looking for strong partners who could ski fourteeners with me. 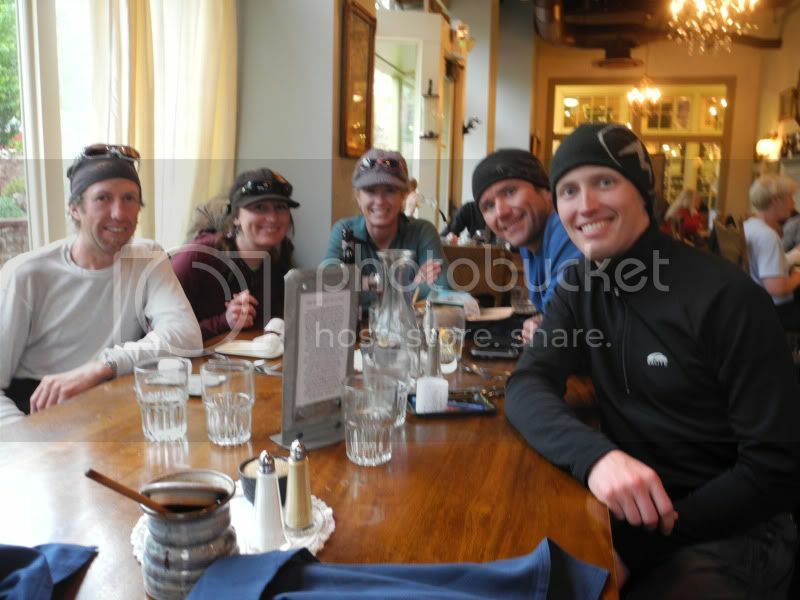 Since then, we have skied 38 fourteeners together (not including repeats) and have had countless other adventures. Thank you for keeping me going throughout this project. I love you! 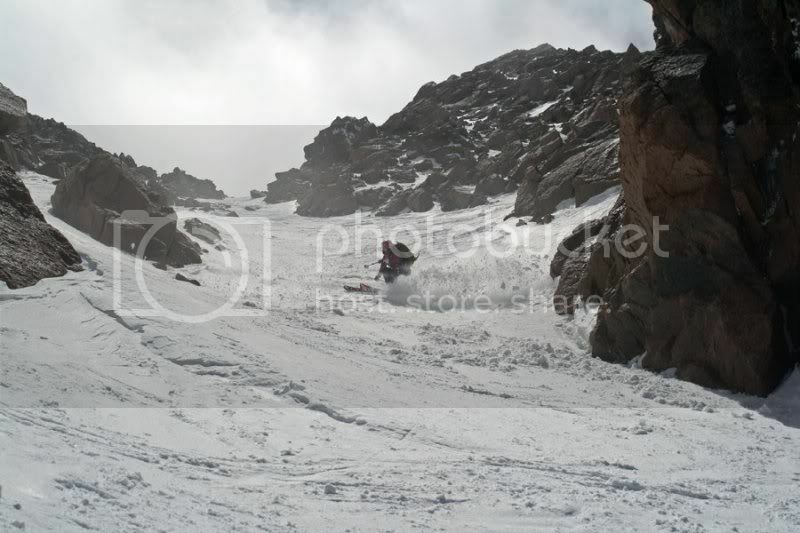 Thanks for following along while I replay my fourteener-skiing journey. It has been a fun one to re-live as it has defined me for who I am today. 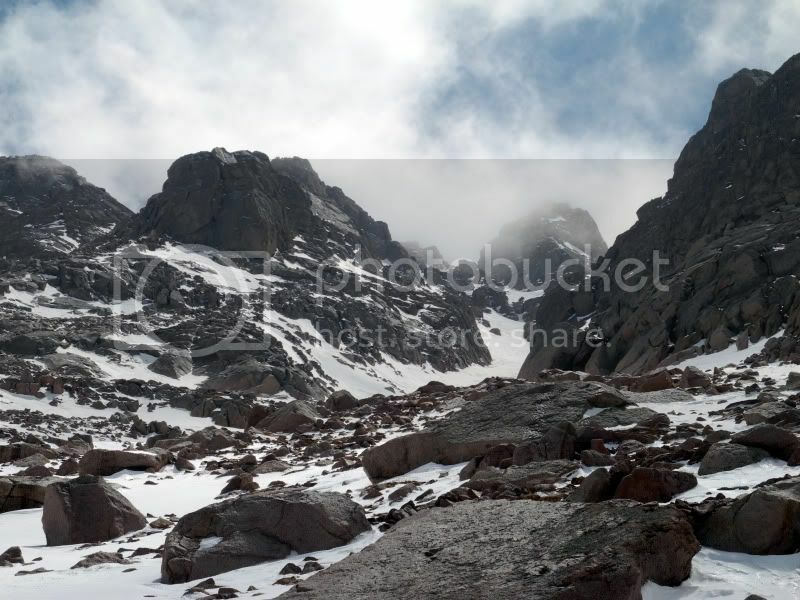 Since I’ve finished, many people have approached me about skiing fourteeners. It’s great to see people out there doing it! While there are definitely a handful of men working towards these accomplishments, I’d like to give a shout out to Otina Fox who is closing in on becoming the 3rd female skier. I’d like to see a female snowboarder jump up to the task though! And please let me know when you do! 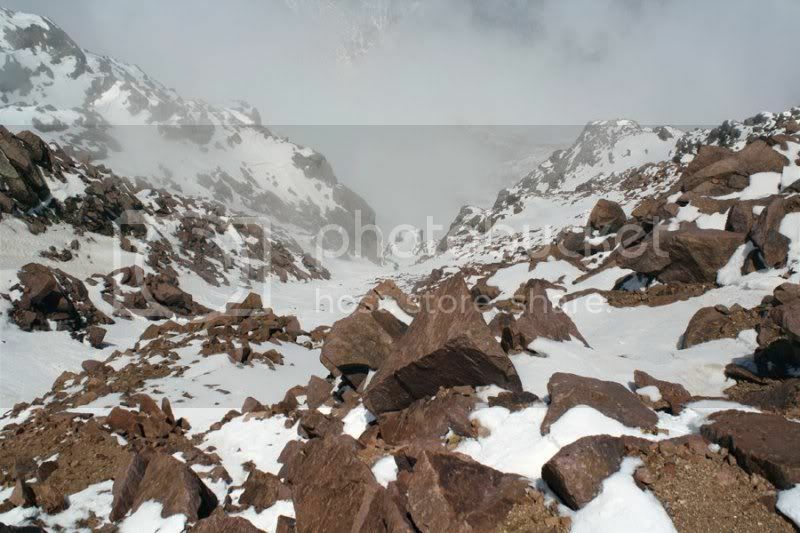 I’ve also been asked for snippets of advice when it comes to skiing fourteeners. I’ve said this before and I’ll say it again – It’s all about the journey. I know those wanting to accomplish this goal want to race to the finish line. But, unless you’re a female snowboarder, the race is over. Now, it’s about doing it because that’s what you want to do. So, take your time. Make sure the line is in good condition. It’s worth the wait. But, I’d also like to bring up a discussion on ethics. 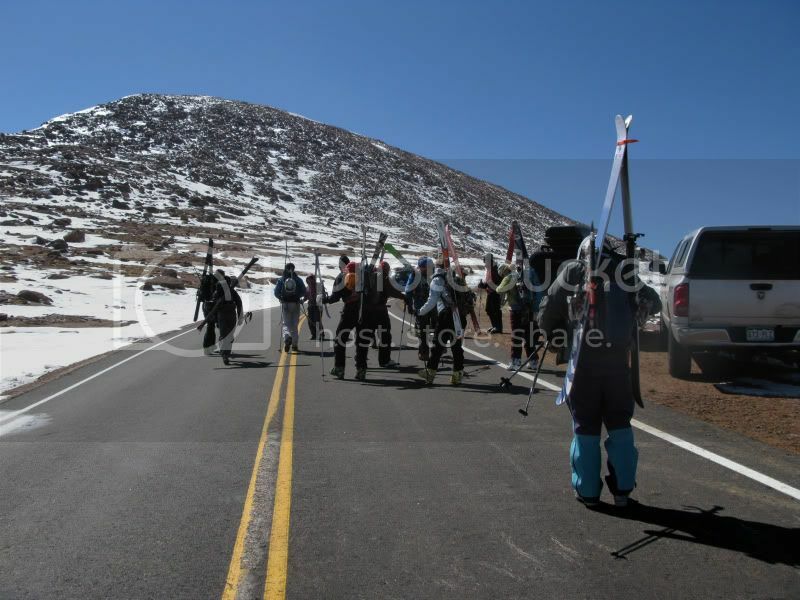 It has come to my attention that a lot of recent fourteener-skiers are not living up to the ethics that have been set by most of the finishers. 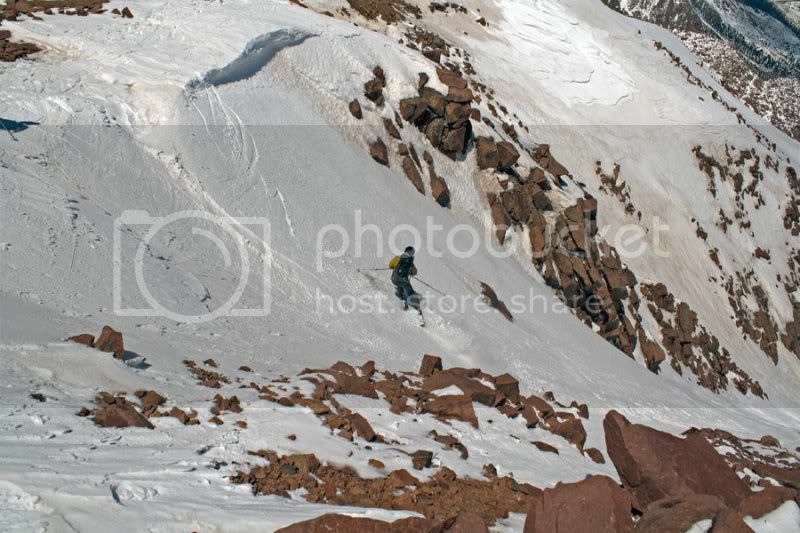 In my opinion, Chris Davenport set the ethics for modern-day fourteener skiing. 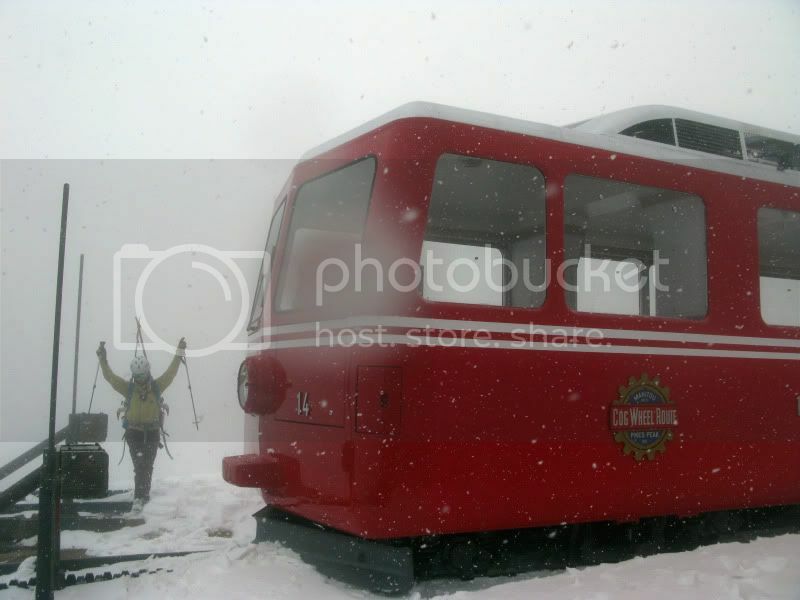 I believe it is our job as ski mountaineers to continue in his tradition and ski the fourteeners as good or better than he did. I’ve talked about the summit descents of Mount Wilson, but this applies to other peaks as well. I know not all fourteener-finishers have lived up to this standard, and frankly, it disappoints me. Last, I also believe that a fourteener should be skied at least 1000 feet, or at least until the line sensibly ends, for it to count. 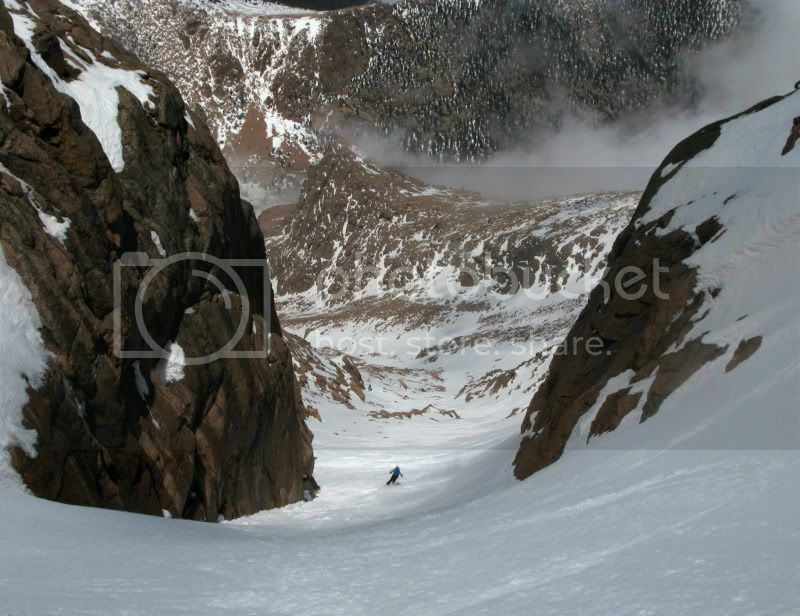 For example, I know some people have only skied the ridge on Oxford rather than dropping into the basin between it and Belford. That doesn’t fit the 1000-foot rule. Ethically, those descents don’t really count. 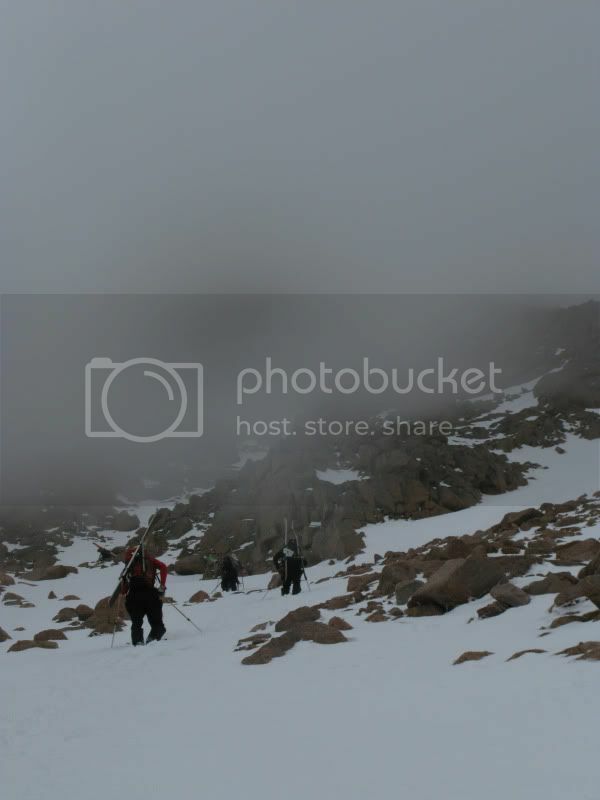 So, to those aspiring to ski or snowboard the fourteeners… I encourage you to uphold the highest ethics so that other ski mountaineers will follow suit. And make sure to enjoy every moment of it – that’s really what it’s all about. 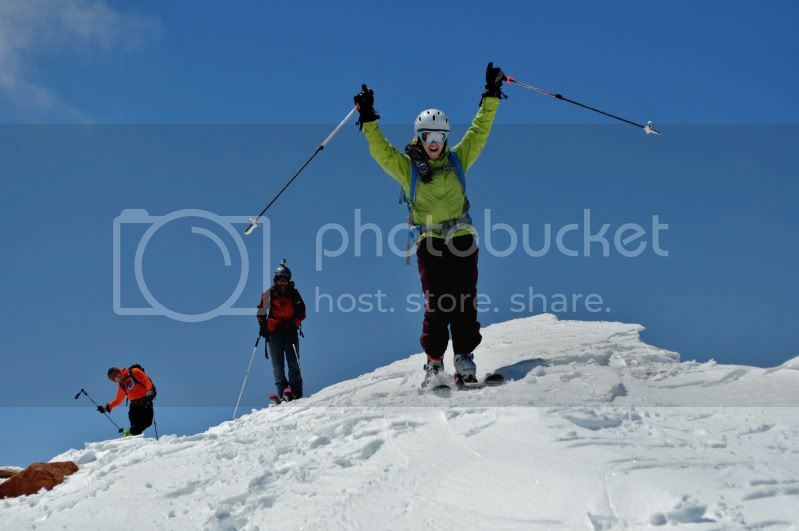 Join Brittany as she recounts her descent of Pikes Peak, her final peak before becoming the 2nd woman to ski all of the Colorado fourteeners! Have really enjoyed this series! Thank you so much for the insight and inspiration. Loved this post on many levels. Great introspection. Congratulations to you again as you celebrate a five year anniversary of this important milestone. 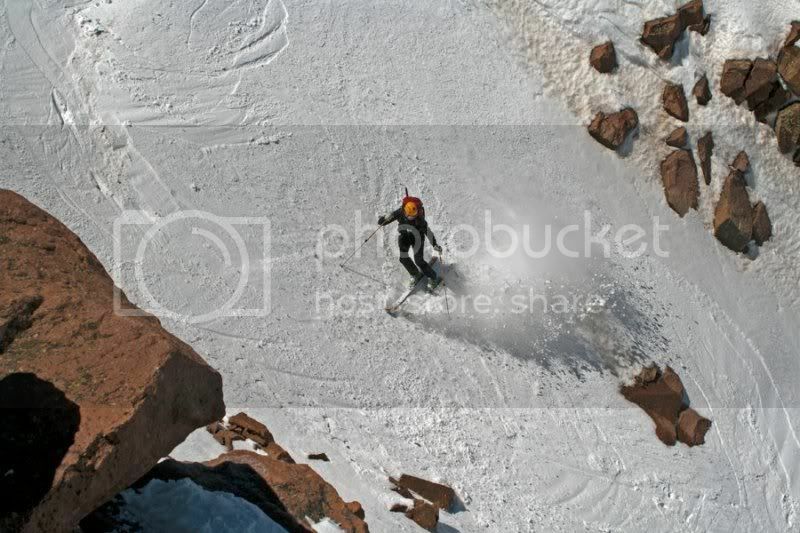 Brittany, I’m surprised to hear you suggest there is a 1,000 foot ski descent rule. 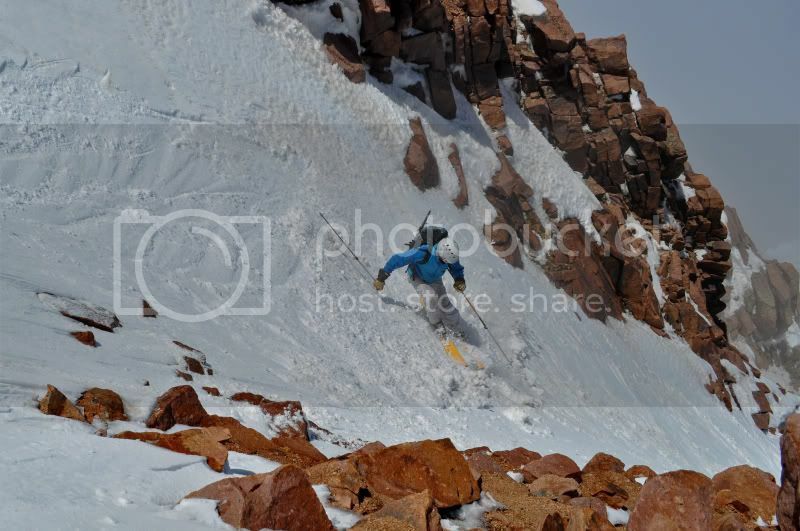 I too was guided by the standards Davenport helped define, and that is exactly why myself and others who have skied the 14ers didn’t find it necessary to drop an extra few hundred feet off the Belford / Oxford saddle. As an aspiring finisher who’s been at it a long time, I’ve tried to apply the standard in vogue as to each mountain at the time I skied it. Unlike Carl and Dav, (with Fritz) I skied Oxford down to the valley for the extra 250 ft. Like (and with) Carl, I applied the standard set by Joe to haul my setup to the top of Wetterhorn and ski for a bit from the summit. I’d say the 250 ft. extra on Oxford and the summit turns on Wetterhorn were equally silly in terms of “skiing” those peaks. But the view from Wetterhorn while I removed my skis was better than while getting ready to reclimb Belford. 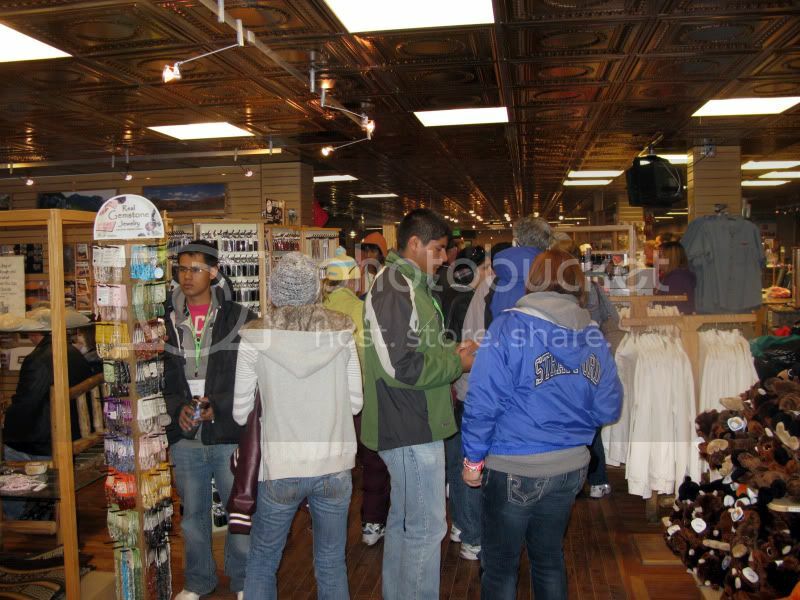 Loved the TBTs. 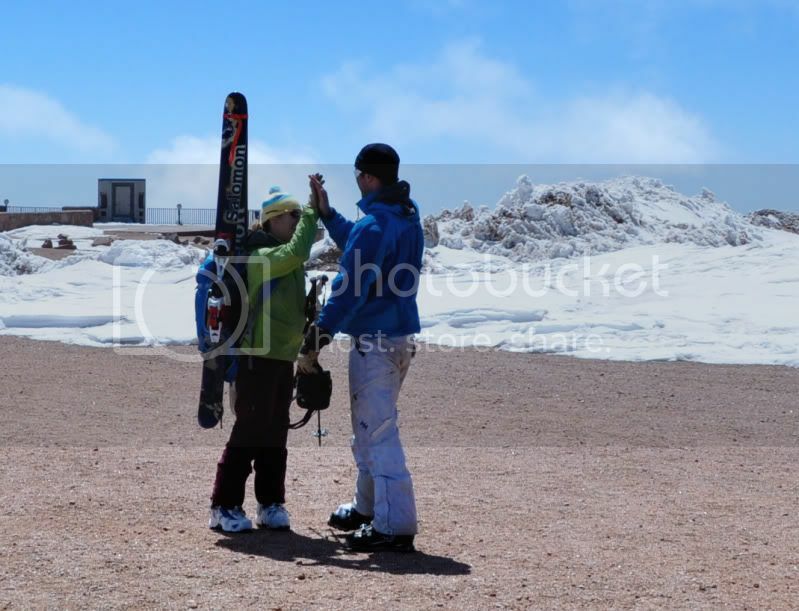 Enjoy the skiing this spring while it lasts. Glad you enjoyed it Rudi! Thanks for reading! Hi Carl. The 1000 foot rule was something Frank and I along with several others tried to abide by. 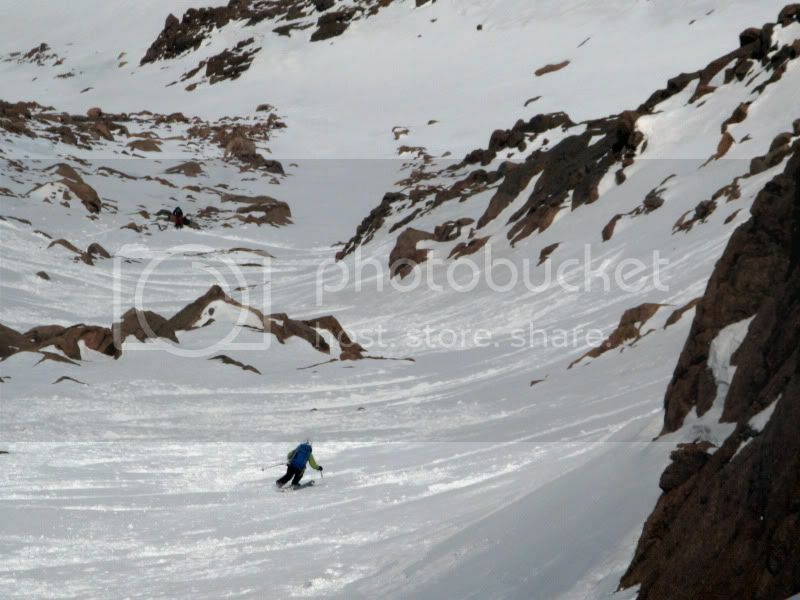 We thought that Dav’s ski of Oxford was poorly done – even though he set such high standards for so many other peaks, he dropped the ball on this one. We thought a higher standard should be set for this one. 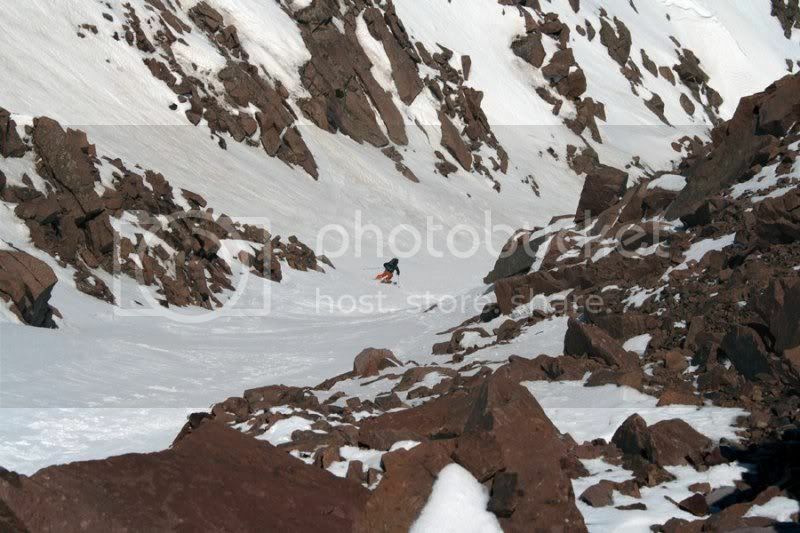 So, we skied it, dropping well below the saddle and finishing in the basin between the two peaks when the line ran out. I mean just ask yourself – is a peak really skied if you only ski to the saddle or just a little below? 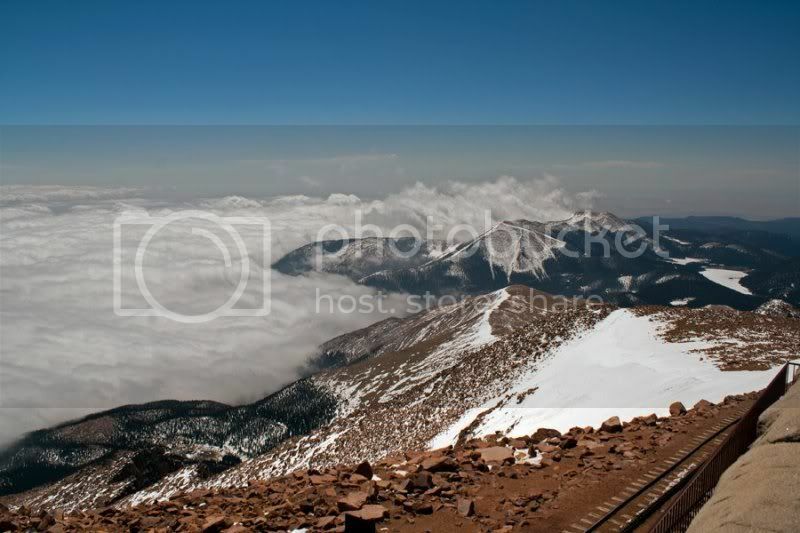 Would you count Grays if you only skied to the saddle between it and Torreys? It’s our belief that a peak is truly skied when you make turns down a line or a face until that line basically comes to a reasonable end. Often, this ended up being around 1000 feet or more. 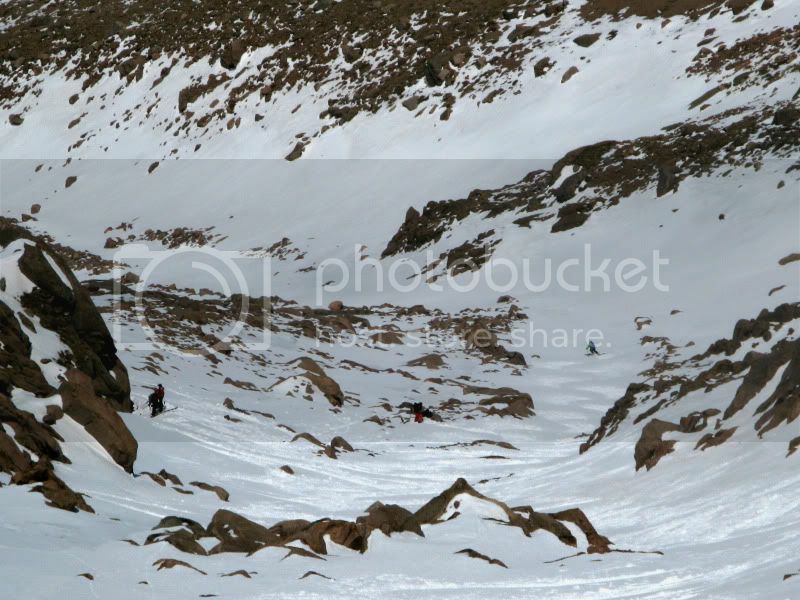 One of the reasons we decided on this guideline was because many of my first 14er descents were late in the season. 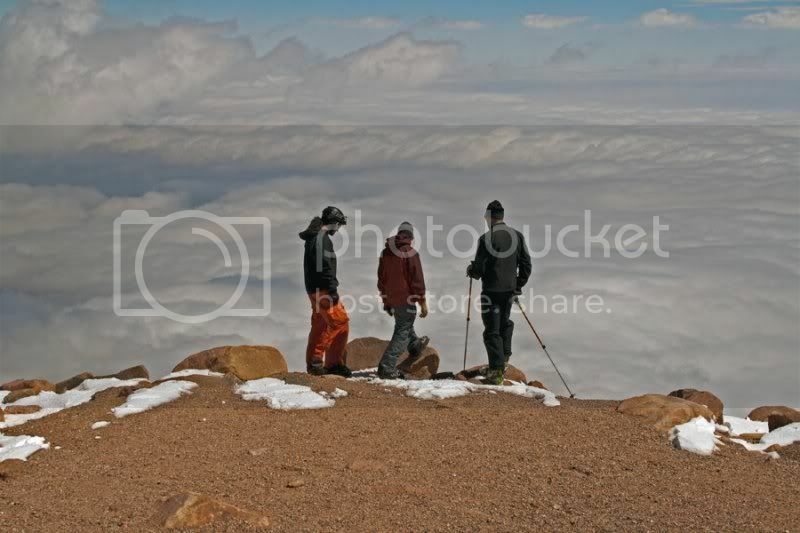 We started questioning what it meant to ski a peak. 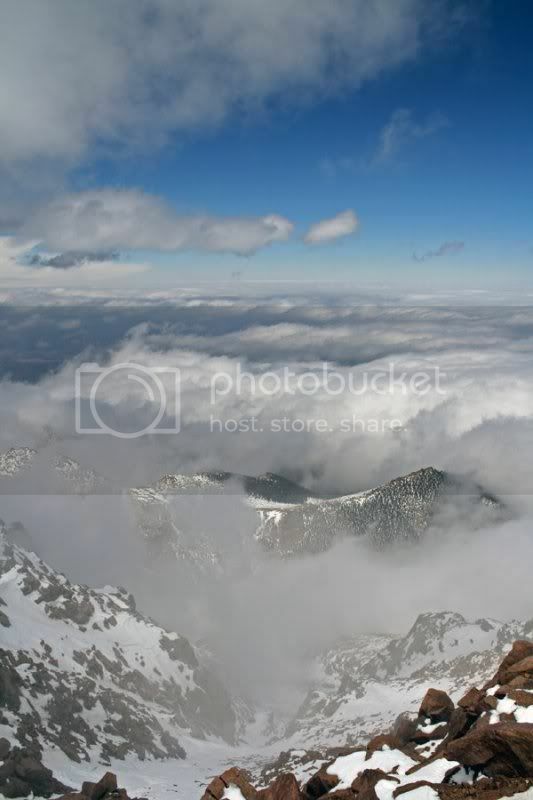 If a peak had snow from the summit all the way to down to at least 300 vertical feet (the same vert as needed to claim a peak as ranked) was that enough? To us, that seemed lame. 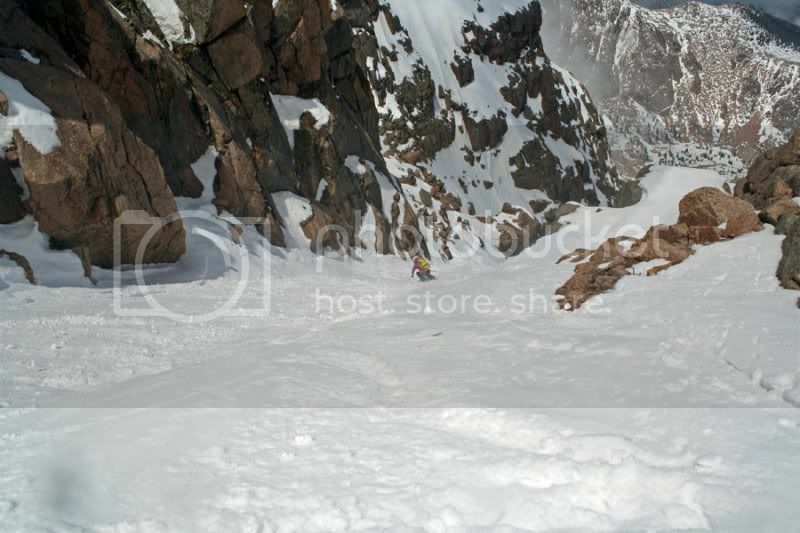 So we decided on roughly 1000 feet since many lines in Colorado peter out around that much vert. 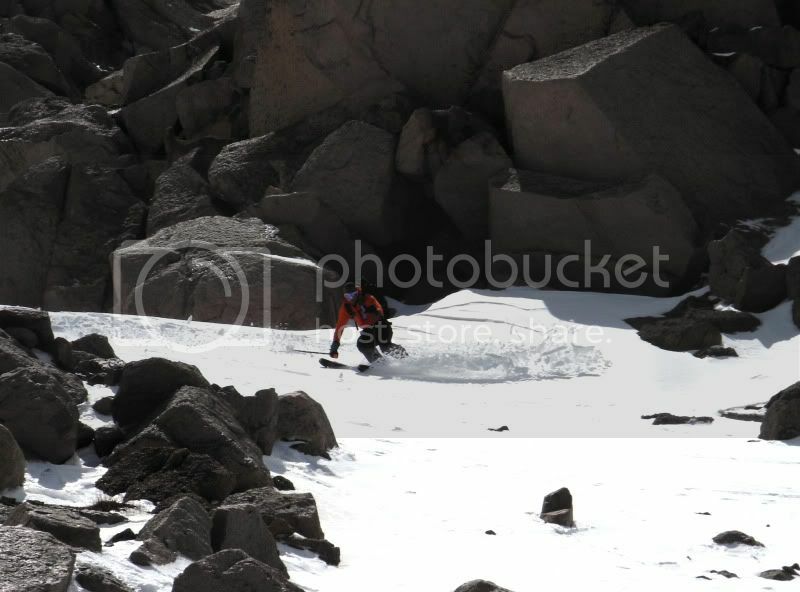 Descending a peak 300 feet to a saddle should be what climbers do, not skiers. 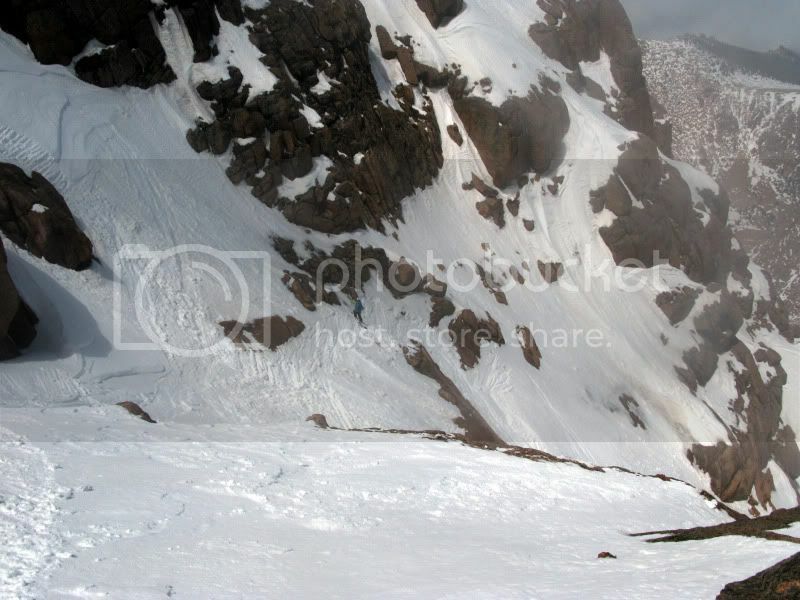 It is my hope that future finishers will ski peaks for the sake of skiing them, and not take shortcut after shortcut to get a peak done. I am not trying to pinpoint individual finishers and say what they did is wrong. 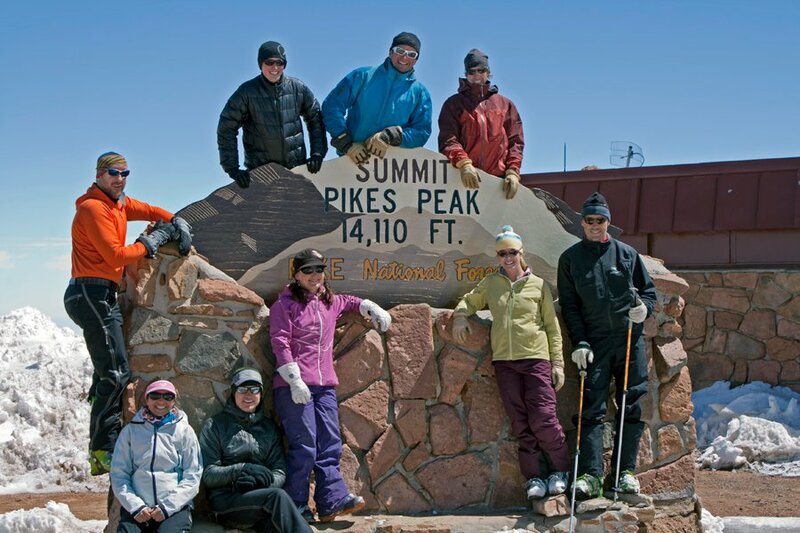 I just want people to make sure to take the time and energy to maintain high standards and ethics, especially when they are accomplishing a project like skiing the fourteeners. Doing these lines in good form is part of the project. Just a great journey! Thanks for sharing them all.